The test of global reactions to sudden corporal position changes in the space (7 to 11 tested reactions), enables to highlight every perturbation in the automatic management of the postural mechanisms by the Central Nervous System (CNS). The progressive transformation of these reactions in the course of the first year of life, in the context of a normal development, is perfectly codified; their examination enables, not only to signal functional anomalies from central or peripheral origin, but also, to specify the level of development reached at the moment of the examination. example of 3 main stages of the Vojta reaction . Tests consist of a sudden change of the corporal posture in the space (here a rapid lateral incline), that induces a reaction of the vertebral axis and of the limbs (here these of the upper side ). The normal reaction transforms in the course the first year according to precisely codified modes. It is therefore possible to discern a normal reaction for the age, a reaction indicating a delay, or an erroneous reaction indicating a central coordination deficiency. Each stage of a normal development is characterized by behaviours answering to precise finalities (orientation, appropriation, locomotion, etc…); these fundamental needs induce the implementation of locomotor strategies, automatically adapted to the postural context of the moment. The originality of the Vojta methodology is to define clearly the cinesiologic content of these locomotor strategies; in other words, postures, support polygons, movements characterizing the main stages of an optimal development are precisely defined; the distinction between a multitude of individual variants and fundamental postural components is clearly made, in order to enable their systematic research at the patient and the comparison with possible pathological succedaneas.. 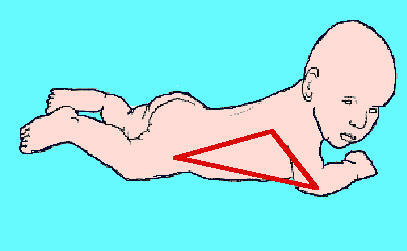 In the prone position, the baby releases automatically the upper limbs and builds a triangular support polygon, with symmetrical support on both elbows that enables the elevation of the shoulder belt and of the superior thorax to heave the head freely in the space, out of this polygon. This postural automatic mechanism, entirely enslaved to the visual need, contributes to the orientation in the space, it consists of a combination of very precise muscular synergisms in the vertebral axis and the shoulder belt insuring the alignment, the symmetry and the stabilization of these corporal regions, that will guarantee the coordinate rotation of the head. The artificial activation of these synergisms is possible from the birth during the reflex locomotion. 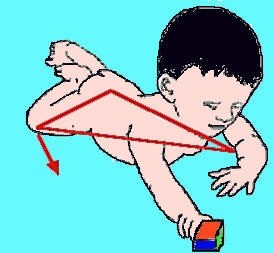 In the prone position, the child has to liberate one upper limb for the prehension. That will be possible by releasing sideways the homolateral lower limb to constitute a new support point on the knee, this new support point will automatically substitute for the disappearing support point at the homolateral elbow . The support polygon is modified. This operation concretizes the appearance of a support diagonal line (from one elbow to the opposite knee); it announces ulterior forms of locomotion such as the dissociated quadrupedic locomotion, the dissociated walking. The automatic emergence of this global postural pattern is a preliminary condition to the good progress of the prehension in the prone position ; it’s again an “enslaved pattern”. This postural pattern includes very precisely coordinated muscular synergisms, of the vertebral musculature, of the trunk and of the limbs; these muscular games are also present in the reflex creeping, which can be activated from the birth under adequate stimulations. A series of reflexes selected in the medical literature, whose modes of provocation, answers and interpretation are precisely described, come to complete the diagram of examination to refine the immediate evaluation but also to specify the prognosis. The long term follow up of many children has shown that the presence or the absence of these reflexes, their quality, their validity period, could be corroborated with different paths of development (spastic, dyskinetic, etc…). The severity of the ” central coordination disorder ” (CCD) is appreciated according to the number of abnormal postural reactions, and of the possible conjugation with aberrations of the reflexology (exceeding normal validity periods of reflexes, qualitatively abnormal answers etc…). The confrontation of these three types of data enables to classify the CCD in several categories, whose the most benign do not justify a physiotherapy, as it was proved by several a posteriori statistical studies, realized with important series of patients. Severe or medium CCD, correspond to a major risk of invalidating complaint ( cerebral palsy, or other illness), and justify therefore the early therapy. light C.C.D can be the expression of sensory or psychomotor various disorder, belonging or not to a definite syndrome , and justifying an attentive supervision of the ulterior evolution or further medical investigations . That shows the importance of this classification that helps the physician to prescribe the early physiotherapy in every necessary case, to avoid useless prescriptions, to anticipate complementary investigations. The CCD is a transitory situation, already pointing out the functional disorder of the CNS. The severity of this disorder has to be quantified to specify the therapeutic indication. There is no cerebral palsy (CP) from the birth; CP is the consequent of a fixed neurological functional deficit, characterized by postural and motor anomalies, that concretize gradually during the development. The CP definitive aspect becomes clearly apparent at the end of the first year and confirms during the second year. During the first months of life, indices of this future pathological situation are therefore not yet evident and the aspect of the child is still frequently very different from what it will be some months later. Thus, for example, a severely spastic CP child, with hypertonic, sometimes almost rigid, trunk and limbs at the age of 3 – 4 years, has often been an hypotonic baby during his neonatal period. An other important element is to consider: when a lesion of the central nervous system (CNS), that occurred before, during, or just after the birth, risks to induce functional aftereffects, it is during the first months of life that the CNS has the best chance to compensate the functional deficit by developing neuronal replacement circuits thanks to its great plasticity. It is therefore necessary to screen for the future CP before it appears under its definitive form, to stimulate, by a very precocious appropriate therapy, the development of neurological compensation means. The expression “ central coordination disorder (C.C.D. )” has been introduced by V. Vojta to designate this transitory situation of the baby during the first year, at the time when the neurological function is already disturbed, when the presence of a CNS lesion could possibly already be verified, but when the evolution is still uncertain. It is then very important to decide immediately whether the risk of appearance of a CP is major and justifies a precocious therapy, or if spontaneous standardization chances dominate, and whether we can or not wait for this good evolution without therapy of the neuromotor development. This decision has naturally not to be taken at random; it has to be based on the totality of medical elements. However the clinic long term experience has fully proved that the simple methodical observation of the child remains a reliable and fundamental element of the evaluation, usable from the birth, and that in case of doubt it is always preferable to preserve all the child chances by applying a precocious specific development stimulation program. It is important to understand that the two actions (diagnosis search and stimulation) can run simultaneously and not successively, since the program of stimulation does not aim at correcting a particular pathological element (that is not yet totally defined), but at activating physiological mechanisms of the neuronal development that will allow to compensate partially or totally the negative influence of a possible CNS lesion. The CCD severity is determined according to the number of disturbed PR, and to the possible presence of abnormal reflexes. The CCD classification in 4 severity groups precises the evolution pronostic. Percentages of spontaneous normalization of the development presented in the next table have been established by V. Vojta from the long term follow up of several hundred risk babies. This table shows the necessity of a precocious therapy of the development in each case of MCCD and SCCD, owing to risks of ulterior confirmation of a CP. This therapeutic action can perfectly begin simultaneously with the pursuit of other medical investigations, without waiting for a definitive diagnosis that may sometimes take time. The development of postural and motor correct functions will be all the more probable since the treatment will precociously start . We can here speak about “prevention” of the pathology, even if it is not always possible to get an optimal result. The P.R. test consists of changing rapidly the position of the child in space, and to observe the immediate reaction of some parts of the body. Each reaction transforms during the first year and passes by characteristic stages at determined ages . That allows to appreciate qualitatively and quantitatively the aptitude of the CNS to regulate automatically and instantaneously the posture and the movement. This automatic function is always gravely compromised among CP children. The utilization of PR is precisely codified, and demands a theoretical and practical learning (formation in Germany: click here) (complete description of the P.R. : SELFORMA module N° 2); it is impossible to detail here the testing technique, but only to present the main usual reactions and tested corporal regions for each reaction (red corporal parts on the table). Galant R. 0 – 4 months.